The eukaryotic translation initiation factor (eIF) 3a, the largest subunit of the eIF3 complex, is a key functional entity in ribosome establishment and translation initiation. In the past, aberrant eIF3a expression has been linked to the pathology of various cancer types but, so far, its expression has not been investigated in transitional cell carcinomas. Here, we investigated the impact of eIF3 expression on urinary bladder cancer (UBC) cell characteristics and UBC patient survival. eIF3a expression was reduced through inducible knockdown in the UBC-derived cell lines RT112, T24, 5637 and HT1197. As a consequence of eIF3a down-regulation, UBC cell proliferation, clonogenic potential and motility were found to be decreased and, concordantly, UBC tumour cell growth rates were found to be impaired in xenotransplanted mice. Polysomal profiling revealed that reduced eIF3a levels increased the abundance of 80S ribosomes, rather than impairing translation initiation. Microarray-based gene expression and ontology analyses revealed broad effects of eIF3a knockdown on the transcriptome. 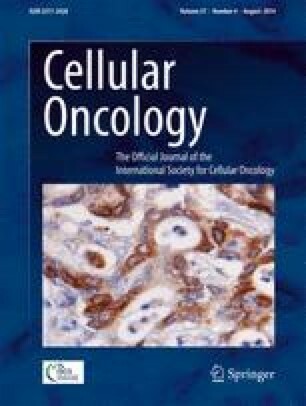 Analysis of eIF3a expression in primary formalin-fixed paraffin embedded UBC samples of 198 patients revealed that eIF3a up-regulation corresponds to tumour grade and that high eIF3a expression corresponds to longer overall survival rates of patients with low grade tumours. From our results we conclude that eIF3a expression may have a profound effect on the UBC phenotype and, in addition, may serve as a prognostic marker for low grade UBCs. Rita Spilka, Christina Ernst, Peter Obrist and Johannes Haybaeck contributed equally to this work. The online version of this article (doi: 10.1007/s13402-014-0181-9) contains supplementary material, which is available to authorized users. We thank Theresa Eder, Veronika Rauch, Gertrude Zisser and Isolde Gunsch for their excellent technical assistance. We thank Mag. Karin Osibow for critical reading of our manuscript. The authors declare that there is no conflicts of interest.